Fry a chopped onion in a pan. Then fry cubes of bread and set aside to use as garnish when serving. 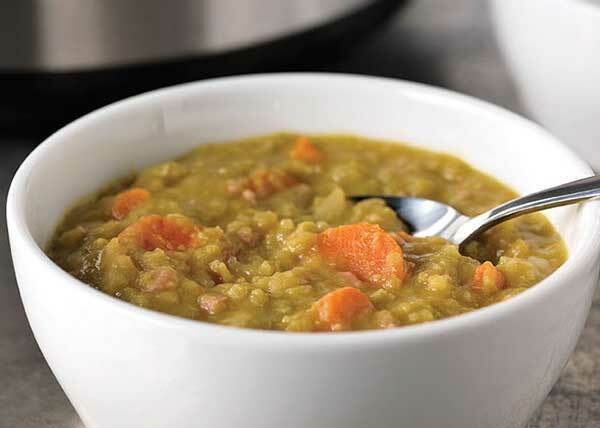 Put 2 cups of green split peas, a pinch of salt, a teaspoon of black pepper, a tablespoon of dark soy sauce or Bragg’s liquid aminos, the fried onions and a bay leaf in a large saucepan with 8 cups/2 litres of vegetable stock (a cube and some water). Boil for 10 mins and then add chopped carrots. Cover and simmer for 45mins or until peas are tender. Add more water if it dries out before peas are cooked. Cut vegan sausages into chunks and add to soup along with 1 cup of soy milk. Reheat til sausages are hot and the soup is piping hot. Top with pre-fried cubes of bread (croutons) and coriander and serve. We love hearing your comments so tell us what you think.